HomeBrowse LibraryHow Does Your Content Marketing Strategy Stack Up? How Does Your Content Marketing Strategy Stack Up? You’re doing so much to keep your small business running day in and day out. You barely have time to think about marketing, but you know you need to. What’s a great way to get the most out of marketing efforts? Since most customers prefer to get information about a company from content marketing rather than advertising, it’s worth putting money and/or time behind creating this content. Our latest infographic highlights the biggest factors in content marketing success. A documented content marketing strategy can be a huge help: 32 percent of business-to-business (B2B) marketers have one, compared to 37 percent of business-to-consumer (B2C) marketers. But a strategy is useless if you create it, then ignore it. Forty-four percent of B2B marketers report meeting daily or weekly to review the effectiveness of their content marketing efforts. Almost half of B2C marketers do the same, according to the Content Marketing Institute (CMI). CMI reports also revealed that marketers allocate between 28 and 32 percent of their total marketing budgets to content marketing. If this investment seems low, remember that generating content marketing material takes time — you may be surprised at how long it takes you or your team to create engaging marketing content! More than 50 percent of content marketers say creating visual content is a priority this year, so if you don’t have a Photoshop or Illustrator whiz on staff, it might be time to outsource some of your content creation needs. Seventy percent of small businesses use Facebook as part of their content marketing strategies, but don’t feel discouraged if you prefer another network. Twitter, LinkedIn and Instagram are all popular, along with video-hosting services like YouTube and Vimeo. The social media component of your content marketing plan also should be strong. Forty-five percent of those surveyed by Wasp Barcode Technologies reported using social media marketing to promote specific products or services. Thirty-eight percent said they share information about sales and discounts, and the same percentage reported using it to gain likes and fans. What about visual content versus the written word? Buzzsumo notes that Facebook posts with images get 2.3 times more engagement than those without. Blogs are still popular, but blog posts with images interspersed throughout the post (about every 75-100 words) get double the shares than those with fewer images. How’s that for motivation to create visual content for your small business this year? 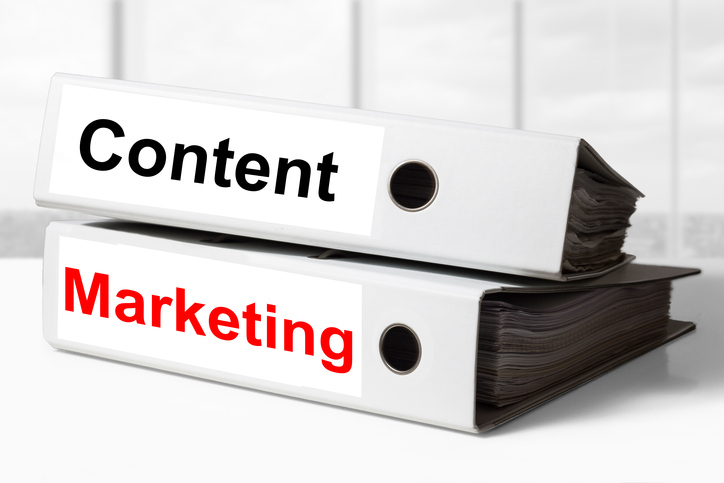 Not sure if your content marketing strategy is working for your business? Meet with a SCORE mentor for another perspective on your efforts — for absolutely free. Download our Content Marketing Best Practices for Small Businesses infographic.